Marco Tardelli remembers the day he and Giovanni Trapattoni knew the Republic of Ireland's players had fully grasped their footballing philosophy. It was 6 September 2011, more than three years since famously pragmatic manager Trapattoni and his assistant Tardelli had taken the Irish reins, and on a flight back from Russia where a valuable point had been earned in their bid to reach the finals of Euro 2012. The Republic did not create a single chance in Moscow that afternoon, but came away with a 0-0 draw thanks to a resolute defensive display, inspired by centre-back Richard Dunne and goalkeeper Shay Given. You could say it was a trademark 'Trap' performance, and he and Tardelli saw it as a sign of the progress their squad had made. The players agreed. Managerial honours: 10 league titles in four different countries (Italy, Germany, Portugal and Austria) including six in Serie A. 'Trap' is the only manager to have won all three European club competitions (European Cup, Uefa Cup and Cup Winners' Cup) as well as the World club title. Tardelli told BBC Sport: "On the plane home, Richard came over and told us he understood why we have won so much, because we pay attention to every tiny little detail of play. "We knew when we took charge [in May 2008] that the Irish players' mentality was like an English mentality and totally different to an Italian player, who prefers to wait rather than trying to make things happen. "In England, there are more chances and more goals, but we wanted the team to be more tactical, more disciplined and more like the approach in Italy. "We told them at the start that, if you have that mentality, then it is possible to achieve any result. "I realised in that moment after the Russia game that they had started to believe us,"
Convincing the players took long enough, but winning over the Irish public and media has been even harder, despite an impressive sequence of results. Taking into consideration the unsuccessful 2010 World Cup qualifying campaign as well as the journey to Euro 2012, the 73-year-old Trapattoni has lost only two of 27 competitive matches as Republic boss, conceding just 18 goals in the process. The disappointment of losing to Thierry Henry's handball in a World Cup play-off against France was matched by the jubilation of beating Estonia to secure a place at Poland and Ukraine - their first European Championship finals since 1988 and their first major tournament since the 2002 World Cup. But that success has not prevented criticism of Trapattoni's conservative tactics - the team has won 10 of the 20 qualifying group games so far under him but scored only 27 goals - or his reluctance to blood new talent like James McClean. The Sunderland winger made the squad for Euro 2012 in the end but had to wait until the end of May to make his first international start. However, Tardelli, an engaging and affable interviewee, explained with an enthusiasm to match his famous 1982 World Cup final celebration why he thinks the Republic's achievements show their methods are working. He makes a convincing case. "The Irish fans have the English mentality too," the 57-year-old said. "But we have achieved a lot by qualifying for the European Championship after 24 years. I am proud of that. Also, we won a trophy last year, the Nations Cup, and the only reason we didn't go to the World Cup was Henry's handball. "For me, the players have improved since we arrived because we found a team that did not believe in themselves. They had lost 5-2 to Cyprus and they were very down. I think now they believe in themselves again. "Results are good and when I walk in the street with Giovanni, the fans are happy. And if people are saying we didn't play well then I would answer that by saying if you are not playing well and working together, then you do not get the results we are." 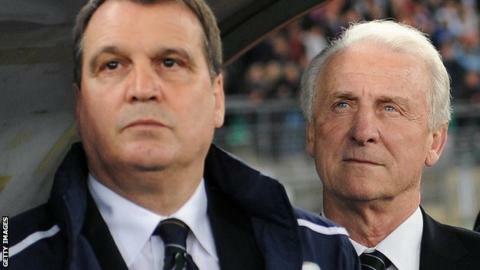 Team-work and confidence are a big part of Tardelli's mantra, and his relationship with Trapattoni is built on both. Tardelli first played under Trapattoni as a tough-tackling midfielder at Juventus in a trophy-laden 10-year stint in the 1970s and 1980s, and it is clear he still loves working with him almost three decades on. Playing honours: All three European club competitions, a European Super Cup, five Serie A titles and two Coppa Italia, as well as the 1982 World Cup. Best moment: His goal and emotional celebration - the 'Tardelli cry' in the 1982 World Cup final win over West Germany. "Giovanni is a gentleman, a great professional and a teacher," Tardelli said. "He loves football, he is a passionate guy and he likes to learn more himself. "He stays on the training pitch for many hours and he watches many DVDs of opponents because he wants to know everything about the other team. "I have learned so much from him down the years. I disagreed with him sometimes when I was a player, yes. But not now. We speak every moment of the day but we never disagree because I understand football the same way he does." They will get the chance to test their joint ideology this summer when they try to guide the Republic out of a tough-looking Group C containing Spain, Croatia and Italy, who Trapattoni managed between 2000 and 2004. Can they do it? "I feel good," laughs Tardelli. "There is something in the air that makes me think we can. If our strongest XI is available then I think we can take on those other sides." It will be the first time Trapattoni and Tardelli have met the Azzurri at a major finals but it is far from a new experience for the pair to be up against their homeland. They drew twice with Italy in qualifying for the last World Cup and beat them in a friendly last year - and there will be no divided loyalties when they try to repeat that victory in Poznan on 18 June. "It will be strange but we are a professional manager and coach," Tardelli said. "When the anthems start, I know I am Italian but my job is with Ireland."